I finally had an afternoon free, to test the upgrade of the base PHP framework CodeIgniter, on one of my websites. The first operation we need to do (especially if the initial coding started long ago) is to find out which version of CodeIgniter we are currently using. We need to search for the constant “CI_VERSION” defined inside the code. In my case the starting point was version 1.7.2. 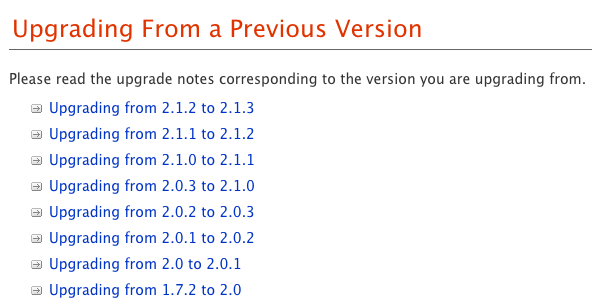 Now we neet to understand which one is the latest version in the download section (currently 2.1.3) of CodeIgniter’s website. The next step is to find out our upgrade path defined on the upgrade page and to download the required packages. In my case I downloaded my current version 1.7.2 and the latest 2.1.3. NOTE: If for any reason you are still running PHP 4, you will not be able to upgrade to CodeIgniter 2.x. It only supports PHP 5.1 and above. I had the need to upgrade multiple pcs with Ubuntu 9.04 without downloading for every single instance all the files needed for the upgrade process to work. You will just need to download the “alternate” Ubuntu iso (that you can find here). and then follow the normal upgrade process through the interface.